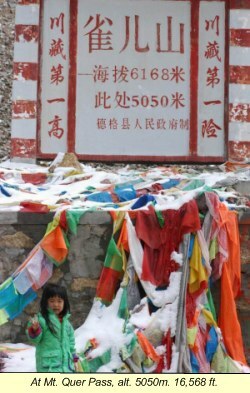 Traveling to Tibet - with Children? 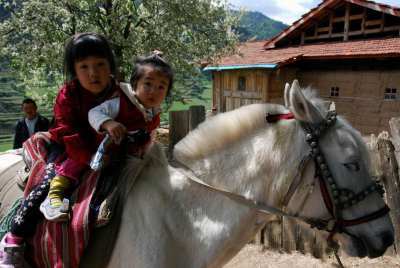 Travel to Tibet - With Children? If you are contemplating a trip to Tibet with children, there are a number of issues that need your consideration. The following advice come from our friends Sim and Maki, who used to live in Chengdu where they ran a small guesthouse. 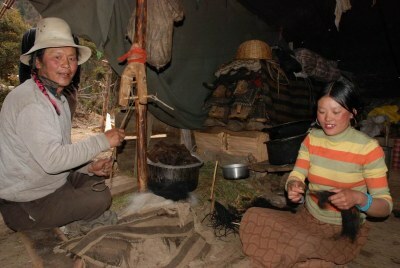 They used to arrange trips for their guests throughout Sichuan Province as well as Tibet. At the time, their two young daughters also joined in the tours, so they had some valuable advice regarding travel to Tibet and the area with little ones in tow. Tibet is home to the world's highest peaks. Because most places in the Tibetan plateau reach 3,000 meters (9,800 feet) or higher, altitude sickness is a main concern, for children and adults alike. One way to deal with the higher altitudes, is to make a gradual ascent and let your body get used to the conditions. For example, instead of flying into Llhasa directly, you can go by train or by car, that way you give your body time to adjust as you reach the higher elevations. Drink a lot of fluids to avoid dehydration. Also recommended is to take Vitamin C and iron (from animal liver), and there are also natural Tibetan Herbal medicines available throughout Chengdu that you can get before the trip and are quite helpful to alleviate the effects of altitude sickness. The sun's ultraviolet radiation in Tibet is quite harsh. Make sure you bring some sun block, chapstick or lip mosturizer, sunglasses and a hat/cap for protection. In Lhasa, you find a variety of Chinese, Tibetan/Nepalese and even Western dishes. 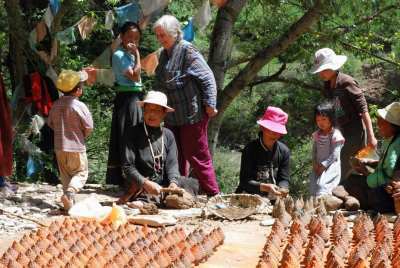 In the smaller towns and villages, the main fare is Tibetan, consisting mainly of yak and mutton, and some Chinese food. Eating facilities are normally clean although they can be very basic in some parts. You could bring some high-energy food and snacks along like granola bars or chocolates for "emergencies." Warn children not to approach any dogs, even when they look peaceful or mild tempered as the dogs in Tibet are specially aggressive. Canine madness is a problem in China. According to the China Animal Vaccine Industry Report 2006-2009, canine madness was the cause for 30% of Chinese deaths that occurred from an infectious disease in the past three years. 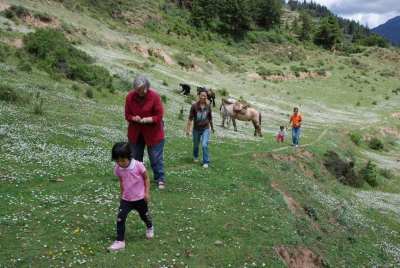 Overall, travel to Tibet with small children is not generally recommended, because of the above concerns and the fact that there will be few things of interest for the little ones to enjoy. The many visits to temples and monasteries will get tedious after a while. As Maki and Sim recommend, there are other places in Western Sichuan that could be very attractive to the family traveler and are easily reached from Chengdu. These places at about 1,800m (5,900 feet) above sea level are at a much lower altitude, offer less harsher conditions for the children and a chance to experience the Tibetan colorful culture. One such place is the town of Danba, home of the Gyarong Tibetan Culture. The Gyarong Culture is concentrated around the Holy Molto Peak, The Molto Mountain is one of Tibet's four sacred mountains. There is much to see and do in the area. You should allow at least 4-5 days for a leisurely pace. The distance from Chengdu to Danba is approximately 400 km. It takes between 9-10 hours if you go by bus, depending on road conditions. Therefore, two days will be spent on the road through some of the most scenic parts of China. The landscape is so diverse, the snowcapped peaks, the streams, the grasslands, the glaciers, the valleys... It is a long ride but well worth it. 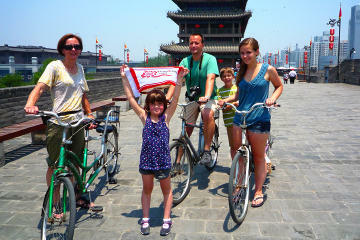 And for the real adventurous families (and with older kids), this is the ultimate journey: let our friend Peter show you the way as he takes you from Chengdu to Danba by bycicle! 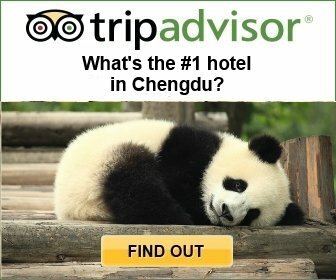 Check out our Map of Chengdu and Vicinity here. These are some of the best guides for the individual traveler.